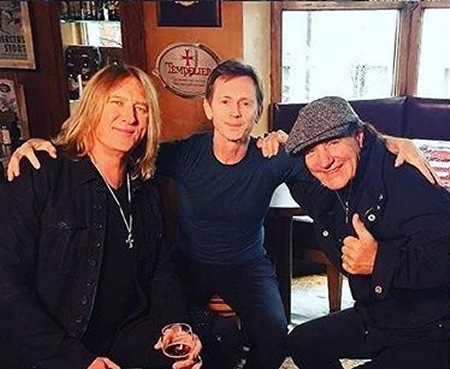 Def Leppard singer Joe Elliott has spoken about the TV appearance he filmed earlier this week in Dublin, Ireland with Brian Johnson. He was speaking during last night's edition of his weekly Planet Rock radio show. The filming took place over eight hours with AC/DC singer Brian Johnson in the Temple Bar area of Dublin. Joe says they also tried out his 'Joe Elliott's Louder' bangin' strong ale at The Porterhouse brewery HQ. Joe did not give any details of when his episode would air. Joe paid tribute to Oliver Hughes of The Porterhouse in August 2016 following his death on 30th July. View a few photos from the filming which took place on Monday 6th March. The clipboard shown in one photo might be from the first filming date of the series but as Joe confirms his scenes were shot this week. "From the remarkable Back In Black album that is of course AC/DC with Have A Drink On Me. And have a drink on me he did because earlier this week Brian Johnson flew into Dublin to interview yours truly for a TV show that he's doing called Brian Johnson's Life On The Road and I was quite humbled to be invited to do it because the guests that he's got on the show are quite extraordinary." "We spent about eight hours shooting the show. We were walking around the Temple Bar area of Dublin in the rain and wind. It was cold and horrible but we did spend most of it indoors at The Porterhouse HQ where he sampled Joe Elliott's Louder beer. To be quite honest I think he quite enjoyed it."